SIM-Drive has developed the Advance Development Model No. 1 named “SIM-LEI” as its nickname. LEI stands for the initial letters of “Leading Efficiency In-Wheel motor”. The object of this project is to develop a prototype of the advanced development model aiming to start mass-production in 2013. This project collected 34 establishments and organizations who intend to enter in the electrical vehicle business in the future. The target performance of SIM-LEI was to achieve over 300km of range per charge, which is generally pointed as the major concern for the electrical vehicle to promote in the market. The prototype achieved this target by 333km of range per charge by JC-08 mode, which represents general urban traffic condition in Japan. The fundamental technologies to achieve this performance are the SIM-Drive original technologies, such as direct drive in-wheel motors and component built-in frame. Other than these two, the following technologies contribute a lot. 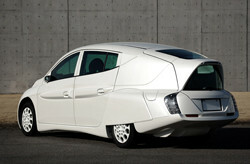 All steel monocoque body contributes to reduce body weight. High power density battery provides highly efficient energy re-generation. Super low rolling friction resistance tire reduces friction resistance. The super low air drag body reduced the drag drastically. The SIM-LEI is as long as medium size sedan, and as wide as a compact car. It has a lot of leg room and large trunk space. SIM-Drive, achieved by 4.8 seconds for 0-100km/h standing start acceleration. This is the performance equivalent to the prestige sport cars. In total 34 Japanese corporations participated in this project. On completion of the development and construction, SIM-LEI proved to be able to drive in long range, and the energy consumption rate is quite favorable. This achievement indicates that if we use mid-night surplus electricity, no additional power generation plant is required even when all vehicles in operation are replaced with the electrical vehicles. Using battery on board of the electrical vehicle as the energy storage, electricity charged at mid-night could be used at daytime for domestic household. 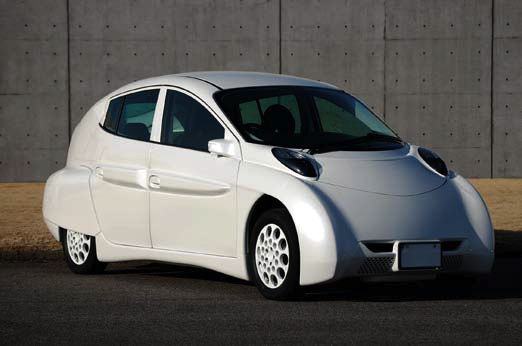 The electrical vehicle can be used for grid storage to help utilities at the peak-times.